When we booked Taiwan, my thoughts weren't on the xiao long baos or the sights, but on Dao Ming Ssu and Meteor Garden. More than ten years ago, I would be running to our house from school to catch Meteor Garden on channel 2. It was the only time I got hooked on an Asianovela. Up to this day, whenever I would be asked which Taiwanese actor I really like, my answer would always be Jerry Yan. Why am I telling this? Because this post isn't really about the restaurant. It is a story on how my friend Niki got to finally meet her ultimate Asianovela crush Joe Cheng. 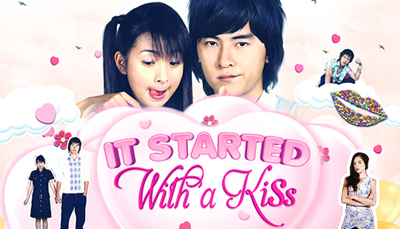 Joe Cheng is the main star of the TV series, "It Started With A Kiss" and its sequel, "They Kissed Again". It was our first day in Taipei, and my friend Niki was told that her actor crush, Joe Cheng, owns a restaurant nearby. Our friend was initially reluctant to look for the place, but we convinced her that it would be wasteful to not even try, and so we did. After asking a few strangers, we found Destino Restaurant. A quaint Italian restaurant owned by Joe Cheng and Ariel Lin. It was our lucky day: Joe was inside, eating a meal at his own resto. We wouldn't want to drop by and not order anything, so we sat down and ordered the Dessert Special Offers, exclusively available between 2:00PM to 5:00PM. For NT$330 (Php 478), you may have French Fries with a choice of dessert (Homemade Tiramisu / Rainbow Cake / Apple Tart / Macaron) and a choice of drink (Coffee Latte / Chamomile Citron Green Tea / Buckwheat Burdock Herbal Tea / Tea Trees Flower & Melon Green Tea / White Grape Oolong Tea / Toffee Tea). I had a Rainbow Cake and Coffee Latte while Niki had a Homemade Tiramisu and Chamomile Citron Green Tea. We were impressed on how the our food was presented. However, it was nothing extraordinary. The Rainbow Cake was dense, but the icing was too thick. It was a good idea that fries was served with it to balance the sweetness. The tiramisu was good enough for my friend and went perfectly with the hot tea. Joe Cheng was quite friendly (and even asked another actor Ethan Ruan to join us, but we didn't know who Ethan was during that time) but refused to have more photos taken after a couple of shots. Still, it was nice of him to spare a few minutes of his time for a little chat and a photo op. Wow he's really tall. I almost didn't recognize him because of the short hair. I saw a few episodes of that series, my cousins went ga ga over it. For sure they'd be stoked too if they see this guy in person. I'm really jealous :(((( I'm from PH also, wish I could see him in person.